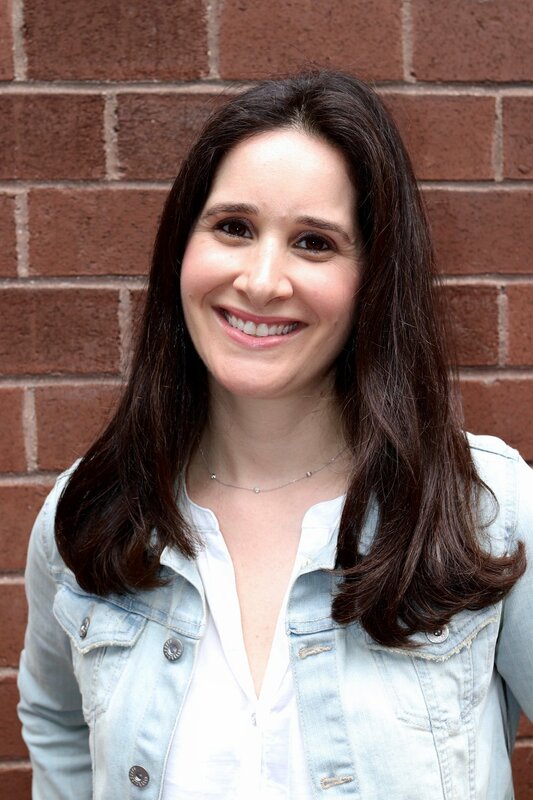 My husband and I moved into our two bedroom NYC apartment almost five years ago and found out that I was pregnant one week later. For a while the apartment felt spacious and I did a great job keeping it organized and functional. Fast forward 4.5 years — I now have two kids and all the gear, toys and more that goes with them. I also have less time to spend culling, purging and organizing. I’ve developed some effective systems for organizing toys and certain other areas of my home (by no coincidence, these are the areas you see most on my Instagram feed). Other areas have me feeling overwhelmed. 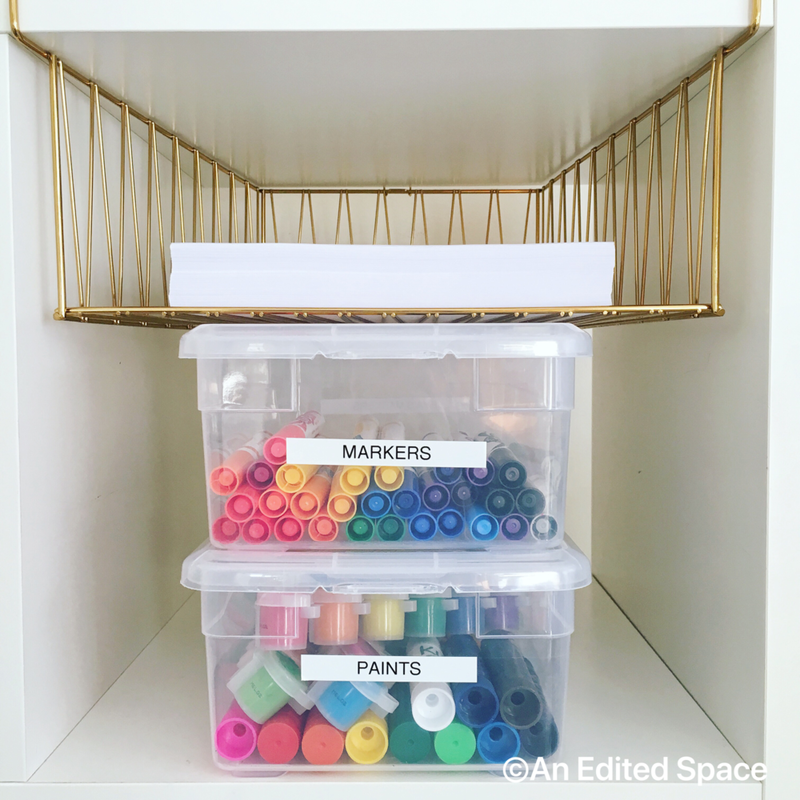 Recently, my handyman came by and commented (in a good-natured tone) that I “used to be so neat.” That was a tipping point for me, and I decided that I need to call in a professional organizer. A few of my friends have used and rave about Joanna Brumberger, the founder of An Edited Space (scroll down for more on Joanna). I’ve seen her suggestions on toy storage solutions and they overlap with a lot of what I already do with our toys, so I figured we would see eye to eye in other areas too. We teamed up to organize my space and share some universal tips for organizing any home. In this post, I share my experience with Joanna as well as her universal tips. If you want to get straight to work, skip to her tips. At the very end of the post you will find click through images of the recommended products. Joanna came by for a consultation to assess my needs, and I gave her a tour of the good, the bad and the downright embarrassing. We identified goals and she emailed me a short list of products customized for my space and needs. A few weeks later we got together again to purge, organize and systemize. In just a few hours we accomplished a lot!!! We focused on three main closets - in the kids room, the master bedroom and in the entrance foyer. We took everything out of the kids’ room and repurposed some of storage pieces that I already had. We really increased the functionality of my space. We moved off season and low use clothes (like tuxedo shoes) to the back of closets. We set up space in the front closet for my husband's workout clothes, since he (like many NYC dads), takes the early shift at the gym and has to get dressed quietly without waking up the rest of the family. 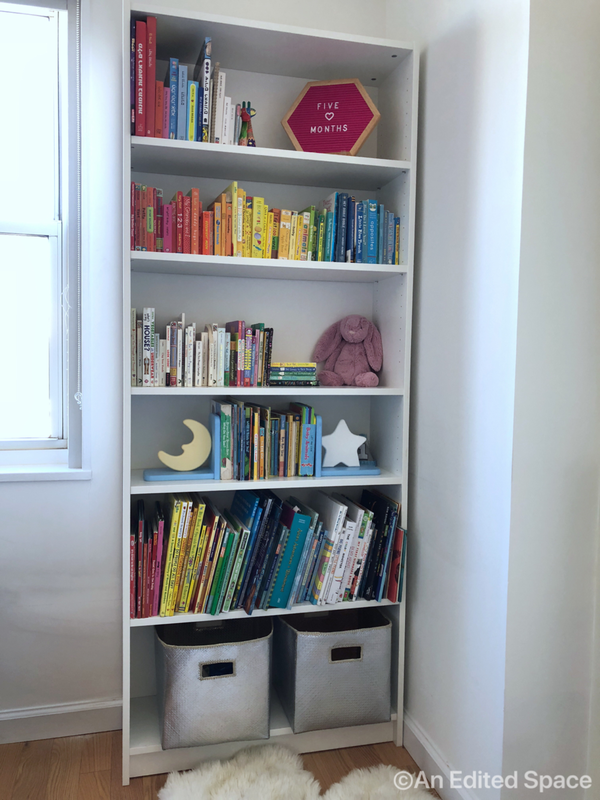 We even rearranged the furniture in the kids’ room and spent a few minutes rearranging my son's bookshelf so that now he can enjoy his rainbow of books (more on his rainbow obsession here. We now spend so much more time in the kids’ room because it’s so inviting! Lastly, we created a plan for paperwork and filing, which has become a source of stress for me. With Joanna’s recommendation, I purchased a new filing cabinet and hanging file folders, and we discussed the next steps for creating systems for my files. I’ve made some headway since we met and feel pretty accomplished about it! 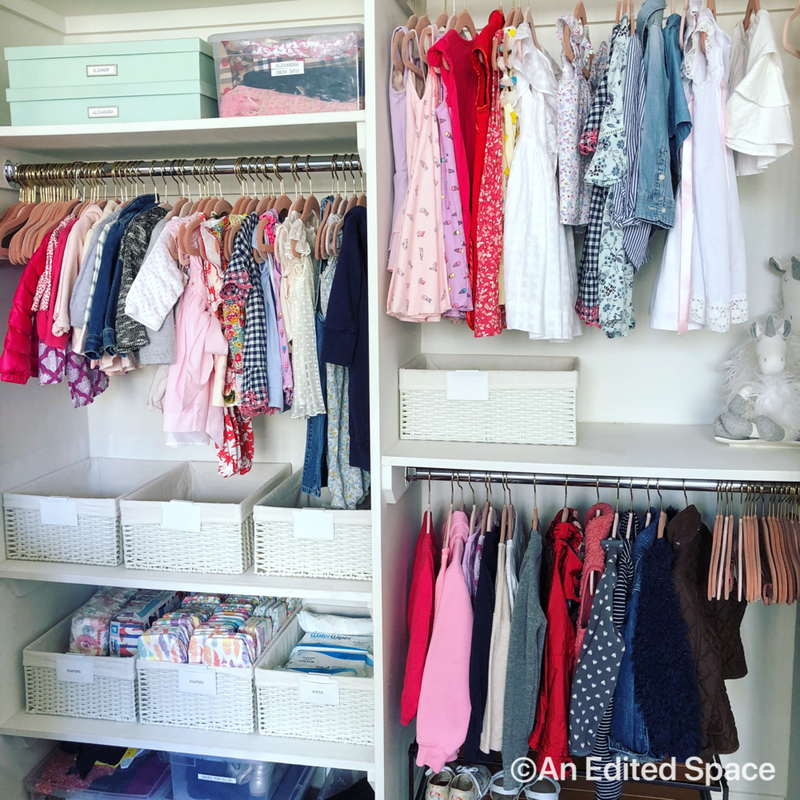 Here are some after photos of my kids’ closet and bookshelf. I never realized how satisfying color coding could be! Click here for details on items pictured. Click here for details on items pictured, and here for Miriam’s top baby and kid book recommendations. We have a second small book shelf for the kids in the living room. The day after Joanna’s visit, I caught my son in the act of organizing it by color too! Clearly he was impressed by Joanna’s work! CONTAIN IT - Depending on the space or your needs, containment is key. Maybe it’s tall clear containers for cabinet shelves, or maybe it’s deep baskets for the pantry. But containing and labeling like items is always best for getting organized, and staying organized. Miriam’s food cupboard. Miriam likes to label the containers (and lots of other things) with erasable labels to make it easy to reorganize and repurpose containers. These labels are dishwasher safe, so can be used to label and date food containers too. Miriam’s kid’s shelf in the kitchen. OXO POP CONTAINERS - These containers are a kitchen staple - just like the flour and cereal that goes inside. Plus the uniform look will update any pantry in an instant. And they are so easy to use, even little hands (aka your kids) will be happy to help themselves in the morning when it’s time to make breakfast. Some people think that the extra step of pouring their cereal (or nuts or crackers) into these containers is not worth their while. And while it’s not for everyone and everything, many of my clients find it much easier than having to open a box and then a bag for cereal every morning. I usually recommend starting with a 5 piece set, and building up an assortment from there. 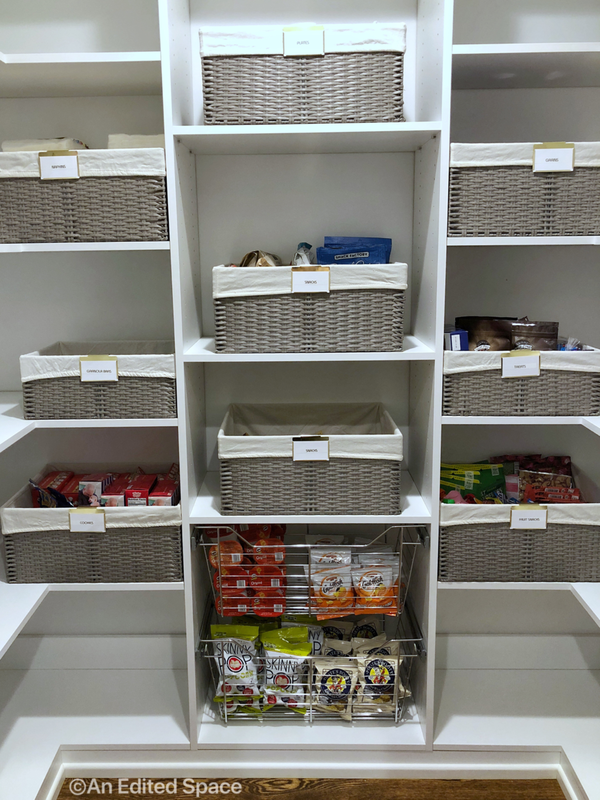 INTO THE DEEP - Baskets and bins are a great way to make the most of deep kitchen cabinet and pantry shelves. Instead of pulling out 10 items from a shelf every time you need what’s in back, just slide out a bin labeled “grains” and grab what you need. These Montauk bins are one of my favorites - they come in two sizes which can mix and match for #shelfie perfection. GO VERTICAL- Don’t be afraid to move around shelves in the kitchen, and when that’s not an option try a cabinet shelf like this one from The Container Store. This lets you make the most all of your vertical space. And using your vertical space isn’t just for inside your cabinets. Do you have kitchen cabinets that don’t go all the way up to your ceilings? Don’t just leave that space empty… get come great bins and baskets and store away! SPIN IT - Using a lazy susan easily brings items that were once in the back of a cabinet to the front with a simple spin. This is great for oil and vinegars and especially for tricky corner cabinets. These days you can find them in so many different sizes - always measure first and get the biggest one you can. UNIFORM - Kitchen items like Tupperware sets and kids plates, cups & bowls should all be uniform. This way they can all fit together properly on a shelf. Mixing and matching sets means that nothing stacks, everything topples over, and nobody is happy. I recommend starting fresh with a Tupperware set like this one. UNBOX IT - I always recommend that my clients unpack their boxed items as soon as they get home from the supermarket. This way, your pantry won’t be filled with boxes of granola bars that actually only have one left. Once you have the right labeled containers, you’ll have a place for everything. WHAT’S THE BEST WAY TO ORGANIZE TOYS IN MY HOME? 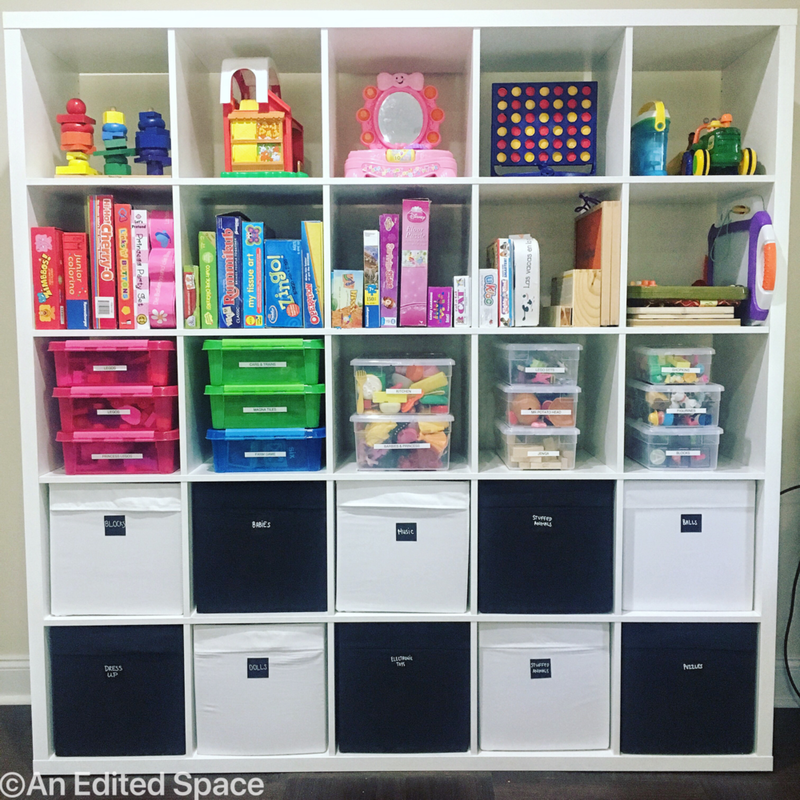 STORAGE UNIT: Make the most of your space with a bookcase or piece of furniture for toy storage - and make sure to think about what’s going to hold the most toys in the most efficient way. Many of my clients have had success with the Ikea Kallax unit. It’s a great unit, at a great price, and it helps to make use of the vertical space on any wall. There are so many different size options so it can be a solution for so many different spaces, from a baby’s room in a small apartment to a large basement playroom in a house. Here are some images of the Kallax in action - always measure, and when in doubt buy the biggest one for your space. 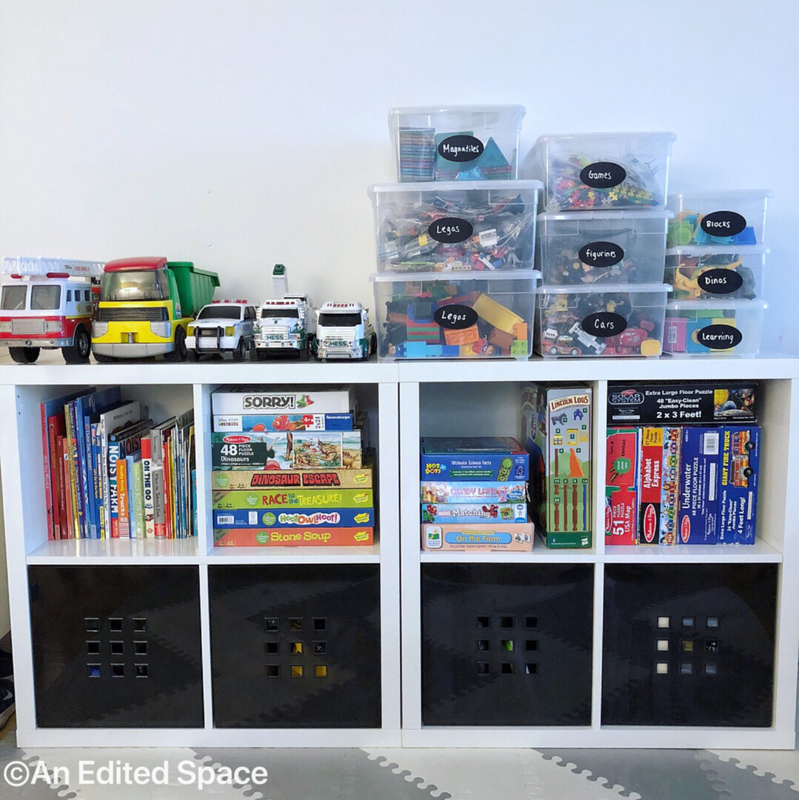 BINS & CONTAINERS: My go-to containers for toy storage are always “Our Clear Plastic Storage Boxes.” Clear means you can easily see what’s inside - which is especially important for little kids who can’t read labels. They stack easily to ensure your space is being used most efficiently. Plus they come in so many different sizes that you are bound to find one that suits your needs. Pro tip: these containers can be used for anything around a home - think toys, shoes, clothing storage, batteries, toiletries, arts & crafts, batteries & more. MAINTENANCE: Keeping up any organizational systems in the home requires constant maintenance, and that especially goes for toys. If you think about it, toys are always coming in… whether it’s a birthday, a holiday, a goodie bag or just a visit from Grandma and Grandpa, kids are always getting new things. And it’s our job as the parents to go through said things and weed out whatever they just don’t need anymore. Look for toys that your children have outgrown, games that might be missing a piece or that toy that drives you crazy every time the sound is on. Find a new home (whether it’s a donation bag or the trash bin) for these toys to make space for the new items that are always coming in. LABEL: Label everything! I am not one to encourage my clients to buy more appliances or products - I am usually a less is more kind of girl. But a label maker is a must for any organized home. And after I work with my clients they usually realize that having their own will be essential to the maintenance of the systems we created. After all, there’s always the possibility of a new file for the filing cabinet or a new category of toy in the bookcase. I love my label maker - it’s easy to use and I have never had any problems with it, so it’s the one I recommend to my clients the most. Find the label maker here and refill label tape here. HANGERS: Uniform hangers will transform the look of your closet - and slim hangers means you can fit more in...and who doesn’t need that! If you do one thing to upgrade your closet, or your kids closets, toss your mismatched hangers and transfer everything on to these. Pro tip: as long as you commit to transferring your clean dry cleaning from the wire hangers back to the flocked hangers before replacing in your closet, the upkeep is simple. When it comes to hangers, I have two favorites, and you really can’t go wrong. Real Simple and Joy Mangano huggable hangers. FILE FOLDING: Instead of laying clothing flat in a drawer, they should stand upright. You can fit more in, and items will not crease as easily too. If you google the KonMari Folding Method you can find the details of exactly how to fold your items. Trust me, you will be amazed at how much you can fit, and how easy it is to see all of those baby onesies in the drawer. 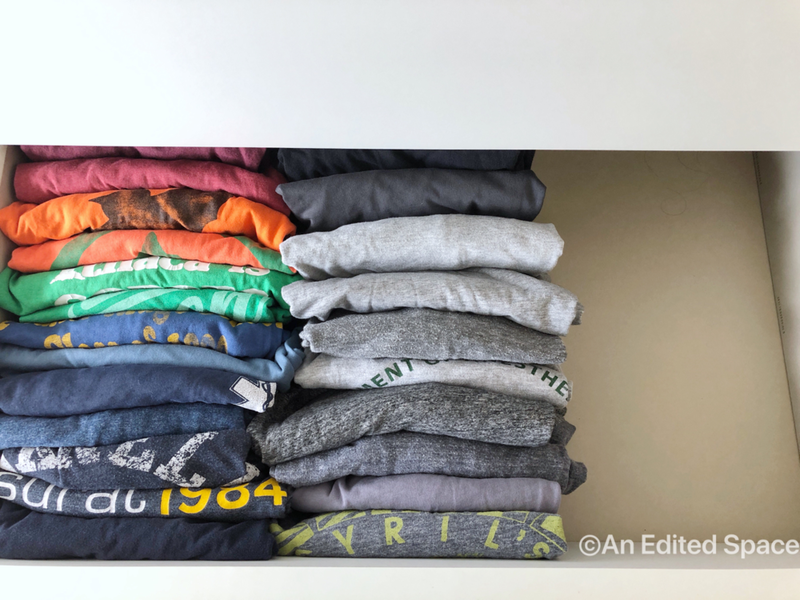 Konmari style “file folding” of clothing. UTILIZE THE DOOR: Finding an unused back of a closet or bedroom door can be like striking gold for a professional organizer. 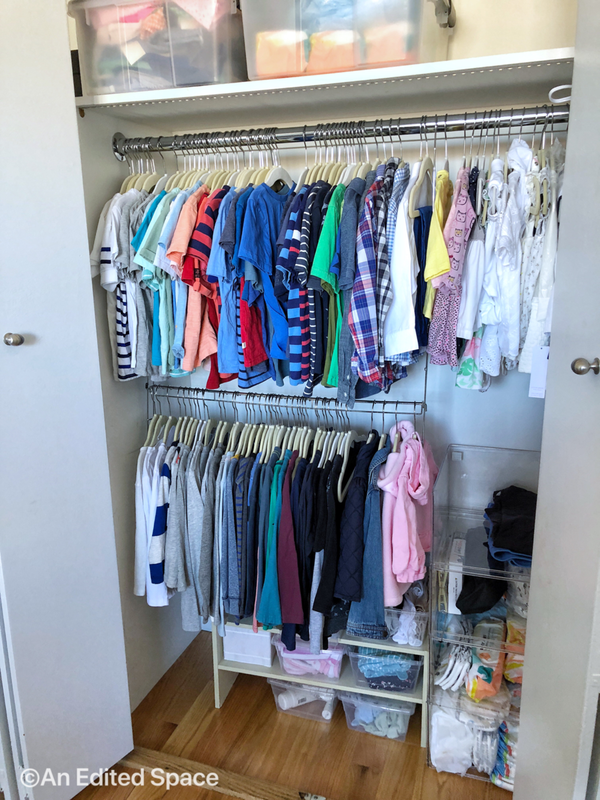 When used well, this space can hold 24 pairs of shoes or bibs, burp cloths and baby blankets, or even an entire family’s winter accessories in the front closet. The long and short of it is to make sure you think about this space wisely. An over-the-door organizer can work wonders inside any closet. Here is just one great option, but there are so many out there. SHOE RACKS: Shoe racks are a great way to make the most of the space on your closet floor. 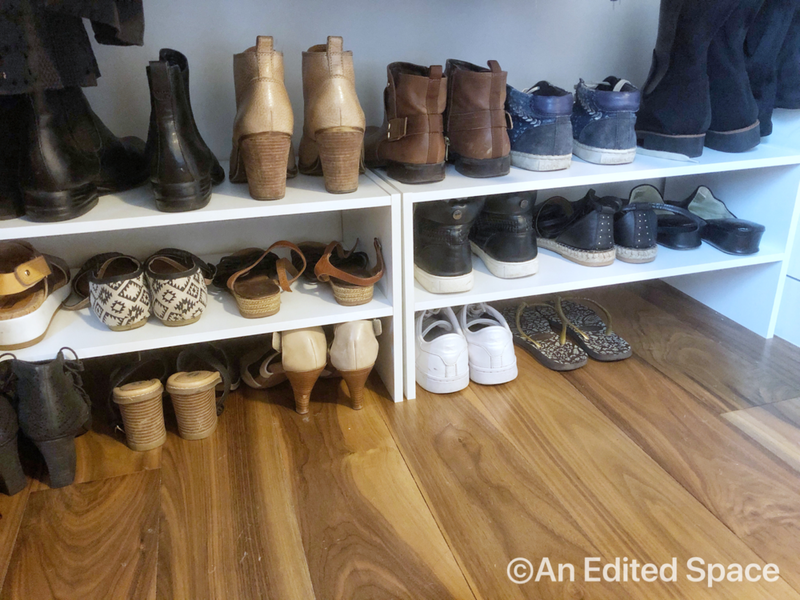 This is one of the products I recommend most - whether you need it for shoes or for other items that you have on the closet floor, a simple shoe rack is a great way to put some order to the piles on the bottom of the closet. These are a great option because depending on how much height you are working with you can even stack two on top of each other for total organizational bliss! Are you ready for a less cluttered and more organized home? Pick a tip and get started! Thank you to Joanna for sharing this incredibly useful information! Be sure to check out her site and social media pages!